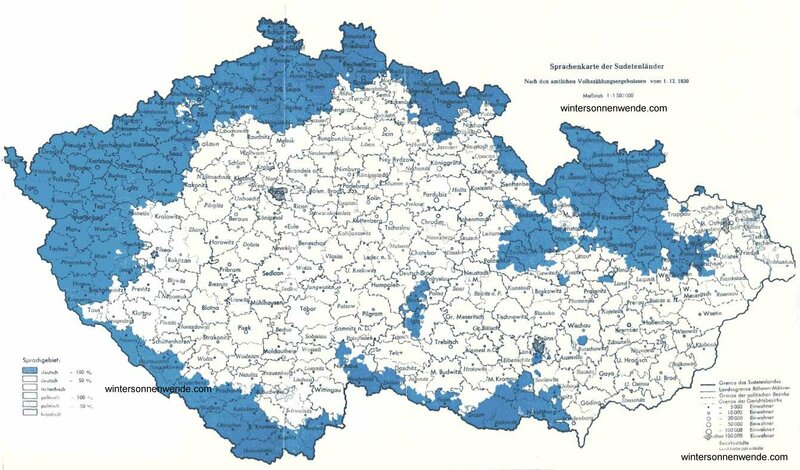 Iglau: Documents on the Expulsion of the Sudeten Germans: Survivors speak out. On May 23rd, 1945, we were ordered to clear out of our house within two hours and were taken to a dirty old textile factory in the outskirts of the town. Here the hygienic conditions were terrible: for example, there was only one single water-tap in the yard for about a thousand men. Three latrines, on the ground floor, were in an indescribable condition, and the stairs on all the floors so narrow that only two persons could pass each other. Young boys and elderly men had to fetch the water for the kitchen in barrels from far away. We slept on the floor, which was soaked with oil, in four rows, side by side. Every morning at 6 and again at 8 we had to line up for roll call. The moment the "Velitel" (commandant) appeared, we had to stand at attention. Our rations consisted of a cup of coffee, a cup of soup and one piece of bread per day. On June 9th, 1945, they told us: "Tomorrow you will march 30 kilometers [about 20 miles], you may only take with you as much as you can carry!" Our luggage was examined, searched for money and the surplus confiscated. On June 10th, 1945 we started to march to Stammern, another camp, in scorching heat. Naturally, everyone threw away anything he could spare, so that finally we had nothing left. Suddenly we were told that the Austrians among us would be allowed to return to Austria the same day. For that purpose we marched towards Teltsch, but within sight of the towers of the town, we were told that our return was impossible after all and we had to march back to Stammern, another 10 kilometers [6 miles]. On our march we were driven with lashes and rifle shots. There were only two short pauses during this 40-kilometer march. When we arrived in Stammern in heavy rain, tired almost to death, we dropped where we stood. At Stammern many of us died of malnutrition-related disease. The camp was located on a hill, surrounded by a fence, and we were heavily guarded; we were not allowed to leave the camp. The women of the village sometimes brought coffee, soup or bread. Since all of us were terribly hungry, especially the children, the mothers would wait at the fence for one of these women to come. One day, seeing a village-woman approaching, three of the women looked out of the camp. Suddenly shots were fired - two women fell dead and the third was wounded; their only crime was that they had looked over the fence. The guard was praised for the deed and even received an award for being such a good shot. I don't want to talk about all the other things we had to endure, but this crime simply has to be reported! Unfortunately I do not know the name of this fine "Velitel". I know the name of only one of the three women, Kerpes; the others are unknown to me, but I am prepared to swear to the facts described at any time. Maybe someone else from Iglau knows this Velitel's name and also those of the other women. On May 13, 1945 the Czech reign of terror began in Iglau. Approximately 1,200 Germans committed suicide the following night. By Christmas [of last year] the death count had risen to about 2,000. On May 24 and 25 partisans drove the German inhabitants out of their homes within 20 minutes, to be locked up in the camps Helenental and Altenberg. These were officially designated as "concentration camps". 3,700 people were imprisoned in Helenental, in Altenberg there were roughly 3,000. There was not enough water, neither to drink nor for other uses. Toilets and washing facilities were nonexistent. We received no food at all for the first 8 days, and later on, only thin soup and 100 g bread daily. Children received a cup of milk only after the first 8 days. Every day, several older people and small children died. On June 8 the prisoners of Helenental were robbed blind, and then marched 33 km via Teltsch to Stannern the next day. We were hurried along with whips. The older people among us were driven on carts only after they had collapsed. This forced march cost 350 people their lives due to debilitation and starvation. In Stannern 3,500 people were squeezed into a camp with an intended capacity of 250. Most of them had to sleep outside despite the rain. The next day, families were split up into 5 different camps, segregated into men, women and children. Again there was no food for 8 days, and then, the usual soups. Once, in the Women's Camp, four women were killed with a single bullet, and one was seriously wounded. The victims included Frau Friedl and Frau Kerpes. Corporal punishment was the order of the day for men and women alike. There was also a Beating Cell. The camp administration hired the inmates out to the Czech farmers as day labor. In August conditions improved, but nonetheless some 500 inmates had died in Stannern by Christmas. In January the Stannern camp was dissolved. I myself was placed in "detention awaiting trial" on January 9, 1946 and released on August 7, 1946. Eyewitnesses told me of horrible cruelties, and I myself experienced my share. On June 10, 1945, 19 inmates from Iglau were taken from their cells and shot in the Ranzenwald [forest]. These inmates included the old city preacher Honsik, Howorka, Augustin, Biskonz, Brunner, Laschka, Martel, Kästler, and others. As late as May 1945 the following were shot in the Court Building without any trial: Krautschneider, Kaliwoda, Müller and Ruffa. One Hoffmann was beaten to death. The overseer who was most feared was Rychtetzky. Factory owner Krebs was scalped. Master builder Lang died of the consequences of maltreatment he suffered. 70-year-old Group Captain Zobel hanged himself in his cell. Many people had been forced by means of dreadful maltreatment to give incriminating testimony and were then detained under arrest for crimes they had not committed. I am prepared to take these statements on my oath and also to bring further witnesses to corroborate them. I was arrested on August 6, 1945 for no reason and without any interrogation, and detained in the Iglau prison for 8 months, where I was badly maltreated several times. Then I had to work in a brickworks, where I lost a finger. I never received any wages. Then I was sent via the concentration camp at Altenberg to work for a Czech farmer. My father and 19 other men were shot in prison without any trial. My mother has been missing ever since she was expelled to Austria. I have lost everything I ever had. I now have 20 kg of luggage to my name. In the resettlement camp all I received was a pair of overalls. The provisions which my last employer gave me for the journey were taken from me in the resettlement camp by the camp administrator personally, and I even had to carry them into his room for him. In the resettlement camp in Iglau we were informed that we could take 50 kg luggage with us per person. Prisoners of war and people who had been released from prisons did not have nearly this allowable quantity, in most cases they only had about 15 kg. At the border the American officer who was to admit us objected to this state of affairs, and our transport was supposed to be turned back because of it. Since none of the people to be resettled wanted to remain, and since the Czech transfer officers also urged that we should go on, our transport was finally allowed to cross the border.